When McKayla Williams enrolled in “The Power of Black Self-Love,” a new one-credit course offered this semester through Emory’s Interdisciplinary Exploration and Scholarship (IDEAS) program, her interest was both academic and personal. Growing up on the West Coast, her schools, her neighborhood and her parents’ friends and colleagues were predominantly white. And Williams, who is black, felt the push to assimilate. Her black identity was rooted mostly in church and family. And through the course, she found herself reflecting on her journey toward identity. “Currently, my greatest obstacle to self-love is the ‘policing’ of blackness and the black experience,” acknowledges Williams, a first-year student majoring in neuroscience and behavioral biology. By examining cultural expectations of how black people are expected to think and act, Williams realized that some of those expectations rose from within herself. But she also found assumptions made about the black experience within both black and non-black communities, from stereotypes around natural athleticism and how to look or speak to assumed preferences for certain kinds of music. Earlier this month, Williams and her fellow classmates shared final presentations, with projects that ranged from the power of social media in supporting black identity to how black self-love has been defined by various African cultures and promoted in popular music throughout the 20th and 21st centuries. To white Americans, the need to examine and affirm black self-love may seem a difficult concept. Shouldn’t that be a given? Created by Stewart and Donna Troka, adjunct assistant professor in Emory’s Institute for the Liberal Arts (ILA) and associate director for the Center for Faculty Development and Excellence (CFDE), the class was designed to explore overlapping areas of two courses: “Black Love,” taught by Stewart, and “Resisting Racism: From Civil Rights to Black Lives Matter,” taught by Troka. The resulting "sidecar" course, “The Power of Black Self-Love,” drew students from both classes, who studied theories of black love and the histories of black social movements. For final research projects, they were asked to demonstrate ways that black self-love can serve as an act of resistance, embodying transformative power. Through the class, students were offered an invitation to dig deeper, investigating the topic through their own research and delving into the world of public scholarship through a very personal lens. Class discussions have explored topics such as the influence of Black Twitter over the last decade, the impact of social media on the Black Lives Matter movement, and the phenomenon of Black Girl Magic, a trending hashtag used to celebrate the empowerment of black women. Stewart’s original “Black Love” class is rooted in longstanding social, cultural and political realities, touching upon slavery, sharecropping, segregation, the U.S. penal system and prison industrial complex, the development of the welfare system and its impact upon black families, and how those impediments have affected the rates of romantic coupling and marriage among blacks and by extension the wealth gap between blacks and whites in America. “So many of these issues compel an exploration of black people’s history with love and lovelessness in North America,” Stewart says. “The challenges racial justice activists confront today mirror the obstacles activists faced during the U.S. civil rights movement and earlier periods. Across such movements, the emphasis on love, or the lack thereof, deserves interrogation and reflection. Her hunch was right. When Stewart listed the class this fall for the first time since 2004, some 80 students enrolled. The idea for the new sidecar course came to Troka as she was teaching “Resisting Racism” last semester. “We were talking about the Black Lives Matter movement — what it means to assert your own humanity, to love oneself as a black person in today’s society — when a student began telling me about Dianne’s ‘Black Love’ class,” Troka recalls. When Troka reached out to suggest co-teaching “The Power of Black Self-Love,” Stewart was open to the idea of academic cross-pollination. They quickly realized that students from both of their classes were interested in a deeper exploration of the topic, too. Among those enrolled in the sidecar course, one student is Afro-Latina, one is white, one is from Central America (El Salvador) and seven are black. 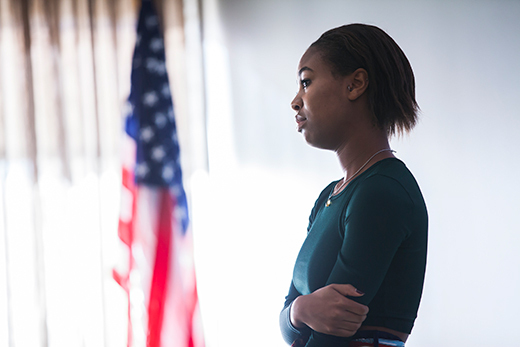 Aiyanna Sanders, a sophomore in political science and African American studies, presented a photo exhibit that explored what Black Girl Magic looks like on the Emory campus. Gretel Nabeta, a junior in interdisciplinary studies and film who is from Uganda, drew from interviews with Emory students from West and East Africa to examine how African cultures influence and promote self-love and the empowerment of women. Nellie Hernandez, a junior in media studies and African American studies, created a video about the power of social media in the lives of black youth to bring awareness to diversity issues and create community. River Bunkley, a junior majoring in African American studies and political science, presented a personal perspective on black masculinity, self-love and the cultural importance of hair care. Amanda Obando, a sophomore majoring in interdisciplinary studies, presented research on the sense of sisterhood and support created through Ngambika, an all-female step dance organization for first-year students at Emory. Shameya Pennell, a senior majoring in religion and anthropology, examined the music of three sociopolitical movements in black American history to analyze how self-love and affirmation are expressed. Julia Feldman, a sophomore majoring in women's, gender and sexuality studies, drew from the poetry, prose and biomythography of black feminist poet Audre Lorde to create a short play that explores her life, love and commitment to justice. Lynette Dixon, a senior majoring in women's, gender and sexuality studies and political science, kept a journal of personal reflection on self-love and examined the theme of suicide indicates a failure of self-love or the supreme act of self-love. Morgan Mitchell, a sophomore majoring in interdisciplinary studies, explored ways in which she learned and is learning to love herself through self-care. To share the scholarship that has emerged from the course, two IDEAS Fellows working with the class have posted student presentations on an Emory scholarblog website — which is available to the public — to help “start and continue these conversations and to celebrate these students,” Troka says. Highlights from the presentations are also on display outside the CFDE office, which is located in Suite 216 on the second floor of the Robert W. Woodruff Library — the same floor as the library’s main entrance.